This post will be serving double duty! 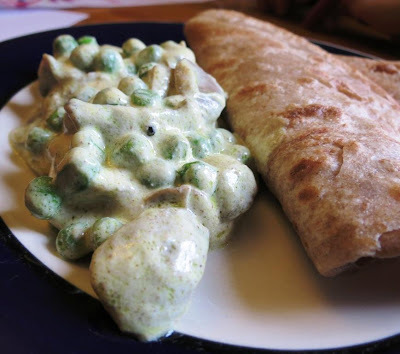 First off I wanted to get back to doing my Random Recipes, that's where the Curried Peas and Mushrooms come in, and secondly I am excited to get cooking Madhur Jaffrey recipes with my friends at I Heart Cooking Clubs, that's where the Parathas come in. We'll start with the Parathas, they are from Madhur's cookbook Flavors of India which I have checked out from the library. The only Madhur Jaffrey cookbook I own is World Vegetarian, and I wanted to take a peek at her other cookbooks too, so I just had to check this one out! Sieve the flour into a large shallow bowl. Make a well in the center and slowly pour in about 1 and 1/4 cups water. Mix. When all the water is incorporated, knead to form a soft, pliable dough. Cover with a damp cloth and leave to rest in a cool place for 45 minutes. This is the basil paratha dough. Divide the dough into 8 equal portions and form into balls. Dust with flour. 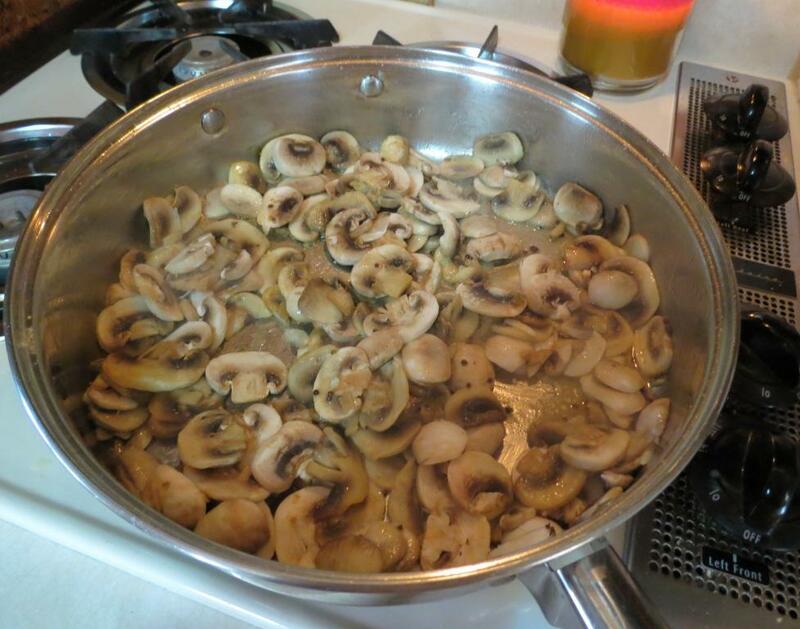 Set a tava or large heavy frying-pan over high heat. I just used my electric griddle turned up to the highest setting (400 degrees). Meanwhile, flatted one ball between the palms of your hands to make a disc. 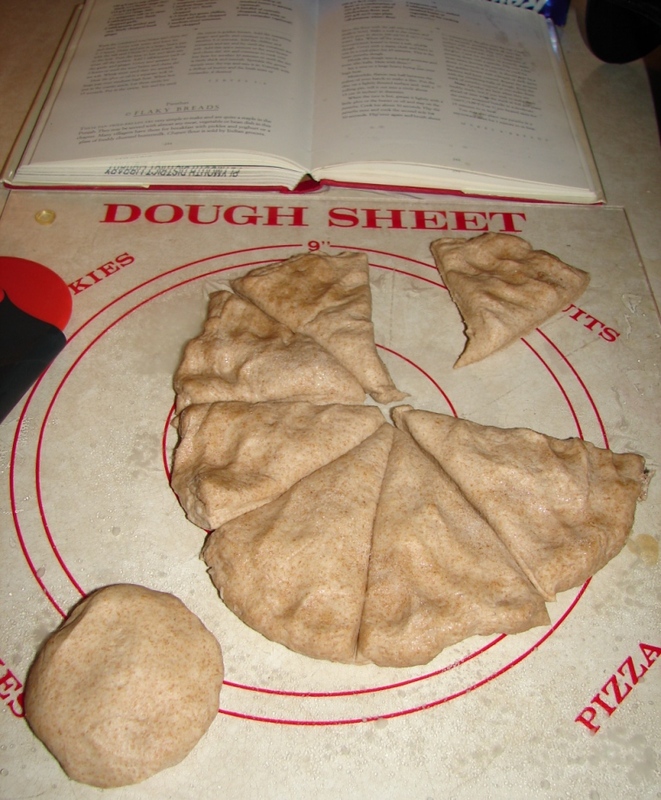 Put the disc on a lightly floured surface and, with a rolling pin, roll it out into a circle about 6 inches is diameter. When the tava is hot, grease it lightly with a little ghee or the butter or oil and slap on the paratha. Cook for about 30 seconds. Flip the paratha over and cook the second side for about 30 seconds. Flip over again and brush about 1 and 1/2 teaspoon ghee over the top. Cook for 30 seconds, pressing down all over the surface with a spatula. Flip over again and brush the second side with 1 and 1/2 teaspoons of the ghee. Cook for another 30 seconds, again pressing down with a spatula. Flip over a few more times, leaving the paratha to cook for about 10 seconds at a time. It should now be a nice golden-brown with a couple of dark spots. Remove and keep covered. Repeat the process with the remaining balls of dough. 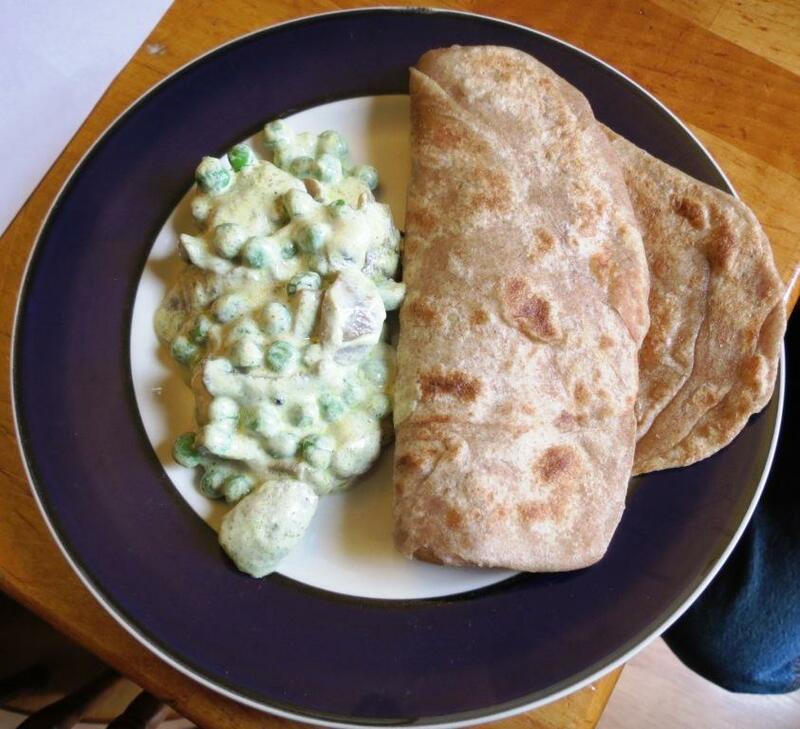 Keep the stack of parathas covered as you make them. 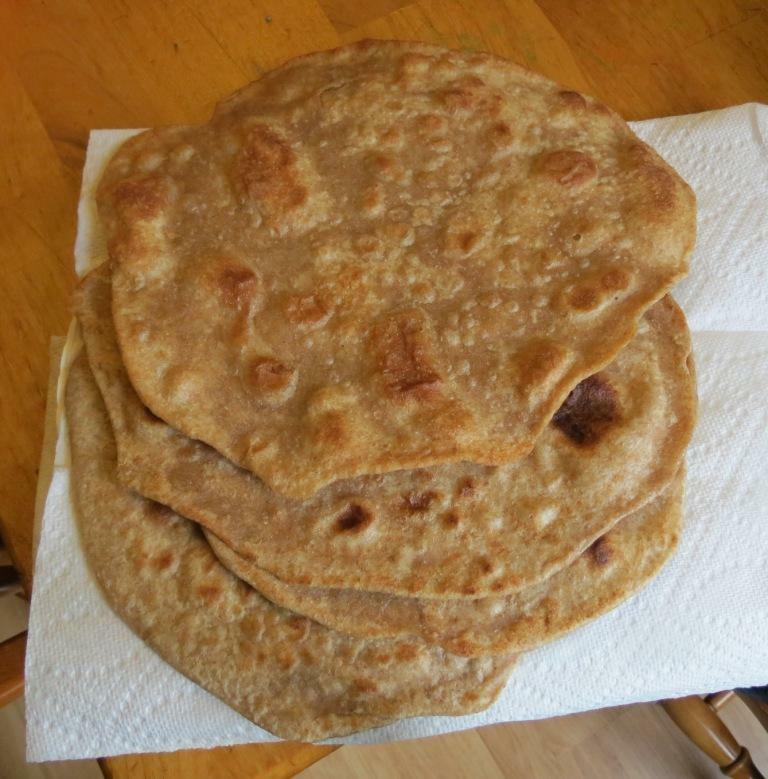 Parathas are best when they are freshly made. 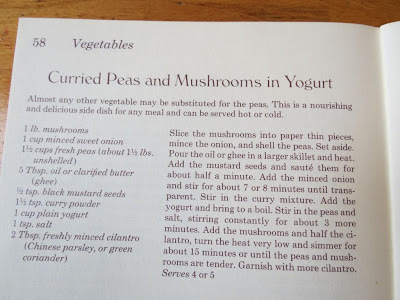 The Curried Peas and Mushrooms in Yogurt is my Random Recipe #10, from the randomly plucked from the bookshelf book, Odiyan Country Cookbook -- International Vegetarian Recipes. This book is from 1977 but I bought it sometime is the past few years, thanks to amazon. 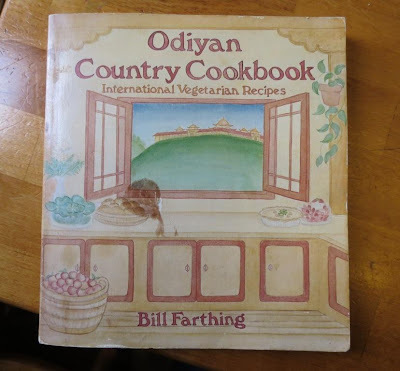 I love older books and finding hidden recipe "gems" and bought a used copy of this one, it has an ink blot on it but other than that is in decent shape for being 30+ years old. Heat up 5 tablespoons ghee in pan, add mustard seeds and cook for 30 seconds until they start to pop, add in 1 and 1/2 teaspoons curry powder and 1 pound thinly sliced fresh mushrooms. Cook for about 5 minutes, stirring constantly over medium high heat. 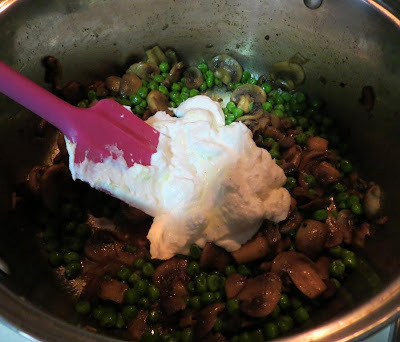 Add in 1 and 1/2 cups frozen peas and saute for a couple of minutes until the are heated up. Turn off heat and let stand covered for 10 minutes. 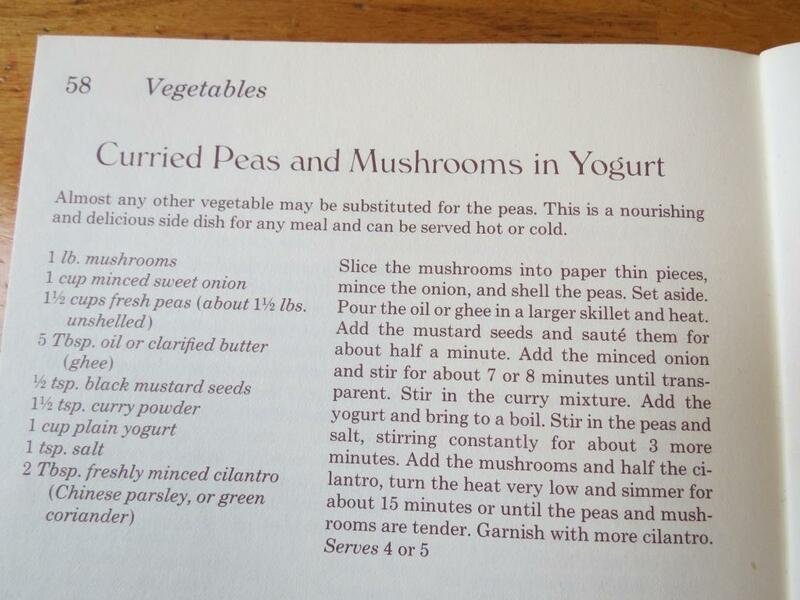 Stir in 1 cup plain yogurt (I warmed it up in the microwave for about 30 seconds before adding to the peas and mushrooms) Add about 1/2 teaspoon salt, stir well, and serve with breads. The kids had one tiny bite and did not like it, picky husband would not try it. I thought it was pretty good but not something I'd be clamoring to make again. The yogurt flavor was very strong (probably because I used Greek yogurt), but the sweet peas and warm curry spices balanced it out nicely. It was fun to try something new and get back into finding a Random Recipe. The parathas were a great pairing with the curried peas and mushrooms and I thought it was a pretty yummy lunch.